Excellent product and excellent service! My order was even delivered sooner than the initial expected date at my request with no hassle! If this is the way this company does business, I will say it’s outstanding! College students and apartment dwellers will appreciate how precious space can be where there is little to be had, but the Milliard Tri-Fold Folding Sofa Bed can provide comfortable seating and sleeping arrangements while remaining portable and cost-effective. It's a must-have for dorm rooms, family dens, or small apartments, since it can be easily set up in living areas for reading, watching TV, or chatting with friends, and then can be stowed away when the floor needs to be cleared. Having guests for the night? The sofa folds flat for use as a sleeping mat, so all your guests need are pillows and blankets. The Tri-Fold Sofa is also portable enough for extended family visits, hotel stays, or camping trips where additional sleeping options could be useful. The Tri-Fold Folding Sofa Bed has been carefully manufactured by MILLARD with your comfort and utility in mind and should provide years of satisfaction with proper use. CertiPUR-US Certified. You can rest assured that this Foam has been tested and is not made with any CFC's, ozone depleters, or PBDE flame retardants, or any lead, mercury, or heavy metals, or formaldehyde, or prohibited phthalates, and has Low VOC emissions to make sure it doesn't affect your indoor air quality. Due to the nature of foam, the firmness level of similar products may produce different firmness results. It was very comfortable when rolled to sleep and very small to store it or use it as a sofa. Arrived quickly! Product is just as described. Perfect for our grandchildren's visits! We would get a set for ourselves, if these were made with a consideration, WHEN FOLDED, for an adult's back AND leg length. I last had one of these foam sofas in 1980. Great to finally see them on the market again. Terrific for little ones to play on. Great quality. I just moved to a senior two bedroom apartment, and this is perfect for my office/guest room. It is easy for me to move around and nice looking. The price is not much different from the 1980 price which was 100 dollars almost 40 years ago. This item is amazing. We are using it in an RV. it works great as a couch and even better as a bed. Comes packed tightly. Followed opening directions and fully expanded. I highly recommend for RV's and guest rooms. Mattress arrived in 1 week as scheduled. Item in great comdition. It expanded quickly with no odor. Mattress is very comfortable and great as a guest bed. Highly recommend. Temporary moved in with my in laws until my house was ready and this mattress is really comfortable and space saving.. perfect for guest staying the night. My kids use these for sleepovers. They are much more comfortable than air mattresses and they don't pop! Super comfortable. 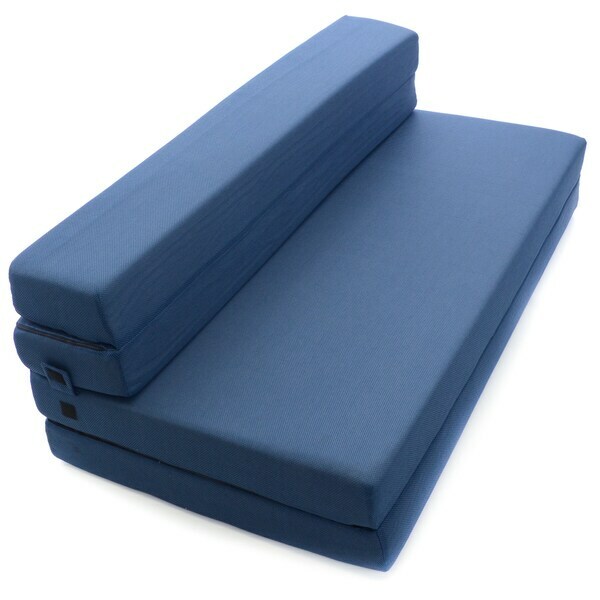 Better than a memory foam mattress because it's lightweight and easy to store. Very nice as couch - works best for the back rest part if it is pushed up against a wall. I didn’t like it only came in one color so I’m looking for a plush queen fitted sheet but otherwise it’s great! Comfortable and easy to store!!! We have in my son’s play room and he loves it.